HOME SCHOOL SAL ISLAND RENT GALLERY LOCATION CONTACT ORDER NOW! 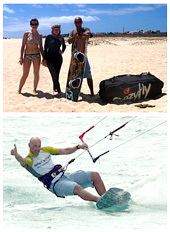 Welcome to Cape Verde kitesurfing! We invite you to country of permanent wind... Let's learn, rent or just have fun with our team in Cape Verde - Kitesurfing BEST KITES! We are here for you throughout the winter season. WE SPEAK ENGLISH, CZECH AND GERMAN. You pay only if we have wind!